The Price of Gas Keeps Falling -- It’s Just 46 Cents a Gallon in This Town! The Price of Gas Keeps Falling — It’s Just 47 Cents a Gallon in This Town! The news is aflutter with dropping oil prices, which hit a 12-year low last week — before closing at just over $30 per barrel. A barrel of oil is now cheaper than a good bottle of wine, dinner for two or a week of macchiatos. We love to celebrate a low price per barrel of crude oil… but what does it actually mean for us? Crude oil prices are the greatest driver of the price of fuel at the pump. So, cheaper crude means cheaper gas. 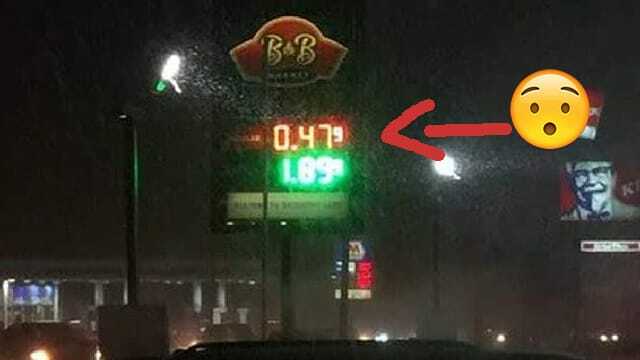 One town in Michigan even has a gas war, pushing prices as low as 47 cents per gallon! Over the last three days, three stations in Houghton Lake, Michigan, dropped gas prices below a dollar per gallon, employees told CNBC. While the Houghton Lake prices aren’t the norm, gas prices are dropping to record lows across the country. Just how low can we expect the price of gas to drop in 2016? The average price of gas in 2015 was the second-lowest in a decade, according to AAA. And we’re kicking off 2016 with average gas prices below $2 per gallon across the country. Gas prices haven’t been this low since 2009. What’s better? Experts expect prices to stay down throughout the year. The average 2015 gas price was $2.40 per gallon, and “the average annual price for gasoline in 2016 could … possibly even drop five to 15 cents a gallon lower,” AAA’s Christine Delise told CBS Baltimore. The 2016 annual average could be as low as $2.03, according to the U.S. Energy Information Association forecast, reports ABC. Aside from an outlier like Houghton Lake, where are you likely to find the cheapest gas? Today’s average is $1.89, and gas prices range from a high of $2.77 in California to as low as $1.60 in Oklahoma, according to AAA’s daily report. The geography of higher and lower gas prices stays pretty consistent. So if you live in California, you probably won’t get to celebrate those sub-$2 prices anytime soon. But it looks like (at least for now) we can rest easy and plan this year’s Spring Break and summer road trips without blowing our budgets on gas — especially if we use these apps to find the cheapest prices nearby. Your Turn: How have falling gas prices affected your day-to-day life? What’s the lowest price you’ve seen this year?